REVIEW – As a gadget nerd, my gadget obsession is very apparent when you look at any of my workstations. I usually have as many devices as possible connected for my work process, some that make my process more effective and efficient, and some just because they are cool. There are also others that only met the criteria for temporary use, whether it was because they lost their cool factor, their usefulness, or were upstaged by a better model or version. 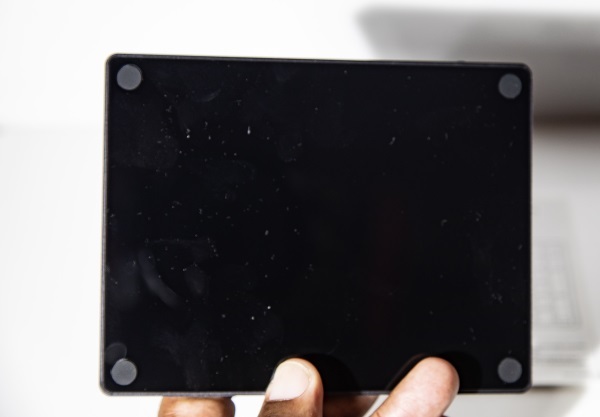 This Bluetooth Aluminum Number Keypad just entered the fray. Let’s see which pile it ends up in! 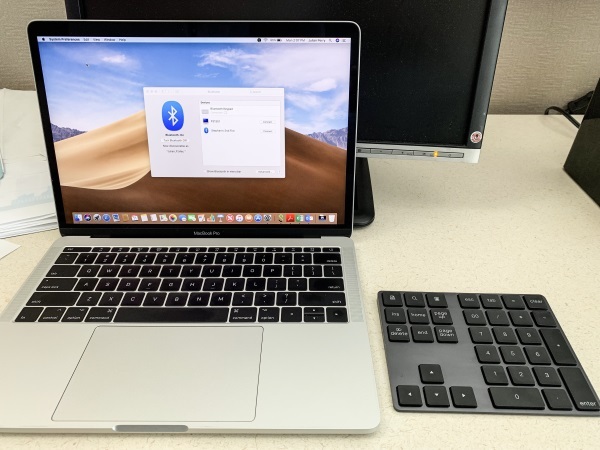 This Bluetooth Aluminum Number Keypad has 34-keys that allow for multiple shortcuts that make it a convenient device to enhance your productivity. It is made of aluminum and is lightweight yet solid. 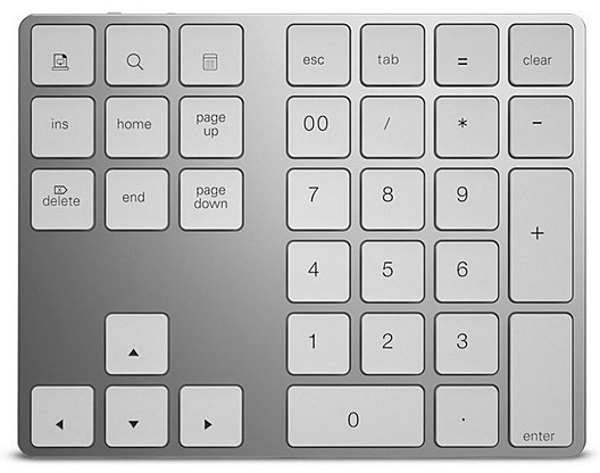 It also features an ergonomic tilt design and pairs with your apple magic keyboard and Bluetooth devices. 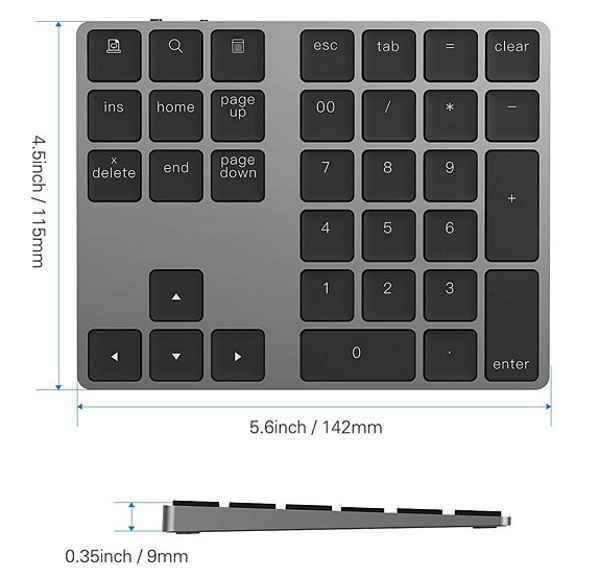 Includes shortcut keys and low profile quiet scissor-switch keys so you can work comfortably on your computer or laptop. Compatible with Mac OS, Windows, Android, iMac, MacBook Pro, MacBook Air, MacBook, Surface Pro 4 / Pro 3, Samsung Tablet Smart Cellphone PC Desktop laptop, etc. The bottom of the keypad is a flat surface with 4 rubber feet, one at each corner, to prevent it from sliding while in use. On the back edge of the keypad there from left to right, there is the LED status indicator that shows when the keypad is charging (lights red) and when it is in pairing mode (lights blue), the micro USB port for charging, the Bluetooth pairing button and the on/off switch. 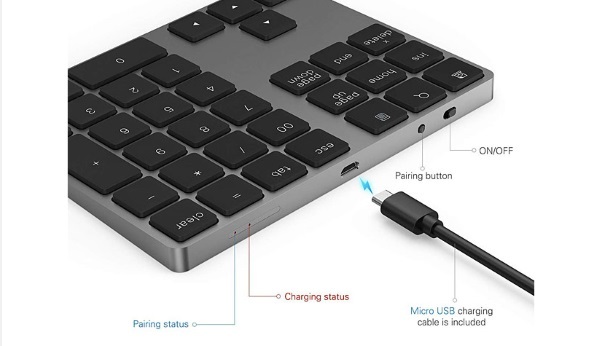 This keyboard is very easy to install, and only takes a couple of minutes from unboxing to being connected. It pairs very easily and is immediately fully operational. 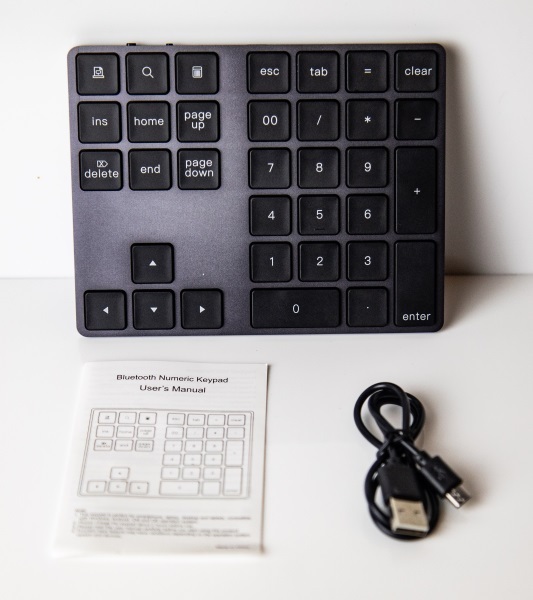 The keypad functions much as you would expect with the numeric part working as numeric keypads do, and the additional function keys adding flexibility and efficiency to your workflow process. The following illustration shows the capability of some of the functions keys. The picture below shows the keyboard connected to my Windows 7 laptop. It works nicely with full functionality. 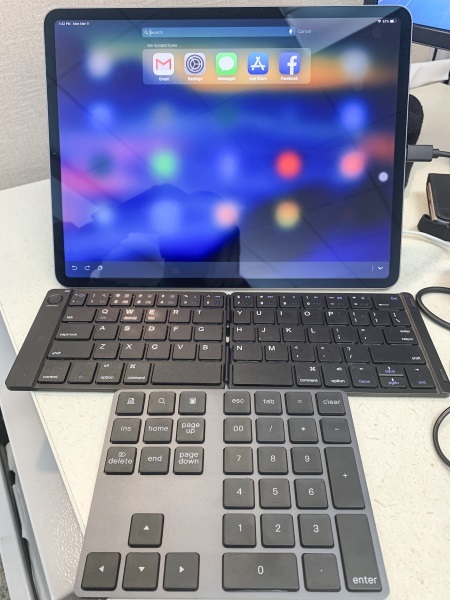 While this keypad is not designed for use with IOS, it does connect easily via Bluetooth to my iPad Pro, and it does have some functionality like search and typing numbers within the message app. I am sure that I will find more functionality as I continue to play around with it. 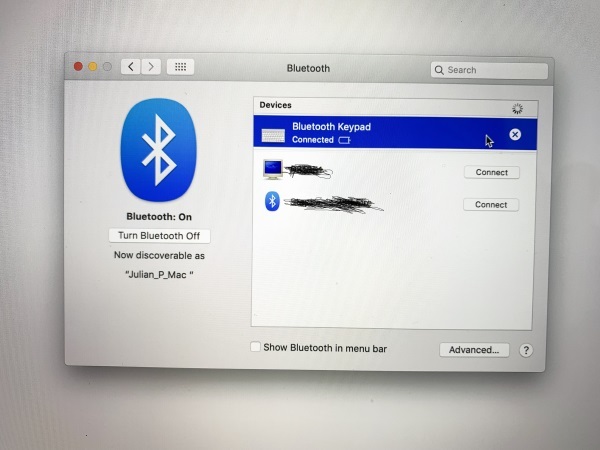 As shown below, I was able to connect the keypad to my MacBook Pro. Once again, the pairing process was easy and like with the PC, the functions worked as expected. 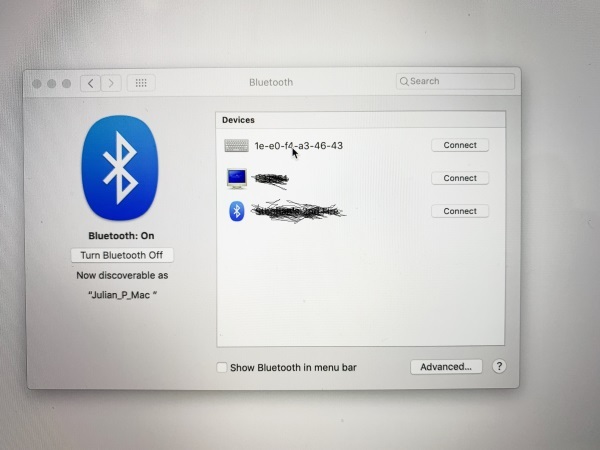 When I first added the keypad to my MacBook Pro it showed up as a MAC address and then as a Bluetooth keypad once connected. 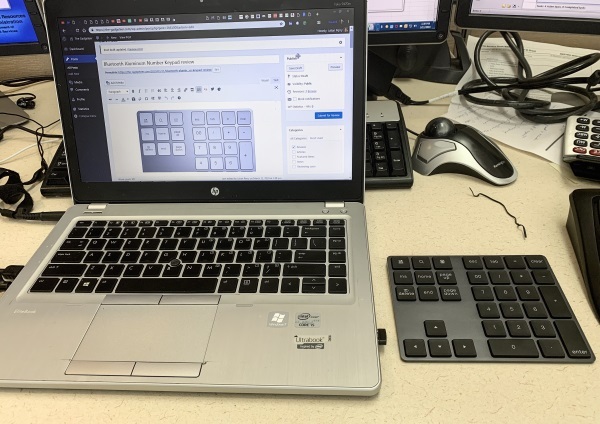 The Bluetooth Aluminum Number Keypad is a nice addition to your workstation if you have a need for it and if it fits into your process. It is lightweight and yet well built. The keys are soft and I would prefer a different clicking action, but that is a personal preference. I use the shortcut keys quite frequently, but I still seem to end up on the numeric keypad of my main keyboard when using the number keys. This is more out of habit. Regardless, I like this keypad. This is an unbranded product. Unknown who made it. Bluetooth 3 is an older version. Bluetooth 4 and above are much better at battery management. An Apple review – reminds me when I asked an Apple Store employee if an Apple bluetooth keyboard would work with windows or my android phone. The non worldly fellow said no, after which I proceeded to pair the keyboard with my phone in the store and it worked perfectly. The review is so full of Apple jargon, one would think it wont work with anything else, notwithstanding the long list of compatible products. I review the gadgets as I would use them in my daily life. While I understand that it uses an older version of Bluetooth, I did not experience any negative impact while testing and using it. In addition, it is my opinion the many of these types of devices work quite easily with the Windows OS once designed to do so. 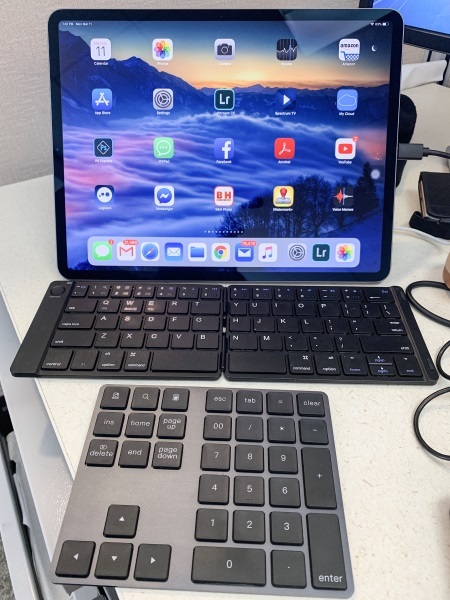 I am relatively new to the MacBook so I was quite interested in that experience, and as a daily iPad user, I was even more interested to see how much compatibility there is since many such hardware items rarely work with IOS. Can this be hooked to a computer via USB, or must it always use Bluetooth?